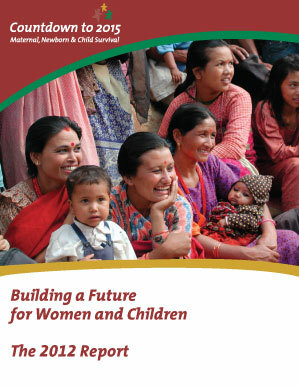 Countdown launched its 2012 Report on June 14, 2012, at the Child Survival Call to Action, a two-day high-level meeting in Washington, D.C. This conference, convened by the governments of the U.S., Ethiopia, and India in collaboration with UNICEF, charted a course toward the end of preventable child deaths around the world. The 2012 Report, Building a Future for Women and Children, highlights country progress—and obstacles to progress—towards achieving Millennium Development Goals 4 and 5 to reduce child mortality and improve maternal health. It focuses, like previous Countdown reports, on evidence-based solutions—health interventions proven to save lives—and on the health systems, policies, financing and broader contextual factors that affect the equitable delivery of these interventions to women and children. Country profiles for 75 Countdown countries were published together with the report. Profiles for individual countries, along with country profiles from 2005, 2008, and 2010, and equity country profiles published by Countdown in 2012 and 2010, are available here. The data and results used to construct Countdown’s 2012 report and profiles are publicly available, and can be downloaded here. For more information about Countdown’s datasets, please contact the Countdown Secretariat at countdown@jhu.edu. The most updated country data on the coverage indicators tracked in Countdown are available at www.childinfo.org.